if you can't read it it says... My Prayer Dear lord I hope you can make fletcher feel better and he can come home with his family soon because I feel bad for him and I love him so much that I miss him. Amen from: opps cant tell I'm not sure why Maddie wanted to be anonymous but she did. Sometimes I don't realize how Fletcher not being at home affects her, but obviously it does. The unit has been closed since January so she hasn't seen him for awhile. Here's a fun little video of my time with Fletcher late this afternoon. I love this kid! Awesome!! I love the shot of his chubby arm :O) when he does the "o". He's so smart and so is Maddie. Children are so sensitive. 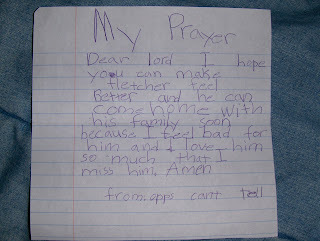 Praying that Fletcher can come home and visit soon and that the unit opens up so Maddie can visit often!!! I can't believe he's FOUR!! That means I'm four years older too...yikes. Love ya!